Arunachal Pradesh is Northeast India's largest and remotest state, as it has railway lines and air services connecting only three of its towns. Some of the areas of Arunachal Pradesh are so isolated that an Indian army reconnaissance recently revealed a tribe still living in caves and leading a nomadic life. They ate their food in uncooked state ignorant about the discovery of fire. They were leading an uncouth solitary life untouched and unaware of the global development and revolution occurring in this fast changing world. There are practically no records relating to the earlier history of this area except some oral literature and the number of historical ruins found mainly in the foot hills dating approximately from the early Christian Era. In 1826 the British exercised their control in Assam after the treaty of Yandaboo concluded on 24th February 1826. 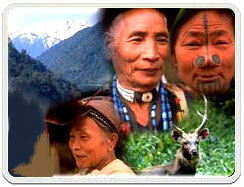 Before 1962 the Arunachal was popularly called North Eastern Frontier Agency and was constitutionally a part of Assam. It was administered by the Ministry of External Affairs until 1965 and subsequently by the Ministry of Home Affairs through the Governor of Assam. In 1972, it was constituted as a Union Territory and renamed Arunachal Pradesh. On 20th February in 1987, it became the 24th state of the Indian Union. The Indian Government has decided to open the state for selected tourism. Due to it typical strategic location, an inner line permit is required to explore the region and converted into a legislative assembly. The state is divided into eleven districts, each under a Deputy Commissioner. Arunachal Pradesh uncanny geographical location has put forth impediments in the form of steep terrain and high hills, making communication with this region of the country a fairly perplexing and onus task. Despite this, Arunachal Pradesh has over 6000Km. of motorable roads and 4000 Km. of porter track, bridle path etc. All endeavors are being made to develop communication to this inaccessible area. This would involve a number of airstrips, new railway tracks being laid down. All this would certainly contribute to a facile communication service so that distance no longer poses a problem for people who possess a quest to explore and discover. This would however go a long way towards the over all revival of this corner state of India, which so far remains, untouched by many. ArnachalPradesh state 2001 provisional pop. 1,091,117), 31,438 sq mi (81,424 sq km), NE India, bordered on the north by the Tibet region of China and on the east by Myanmar. Formerly the North-East Frontier Agency special territory, Arunachal Pradesh became a union territory in 1972 and a state in 1987. 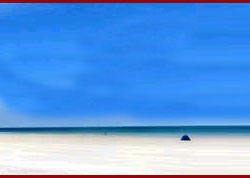 A remote region, it includes part of the E Himalayas and extends through mountainous highlands to the plains of Assam. Its border with Tibet, disputed by China, is known as the McMahon line. It was established by the British, with the agreement of Tibet, in the early 20th cent. The Chinese claim more than 90% of the territory. August, and 61� F (16� C) in January. The cool season is marked by fogs and brief showers. Assam escapes the normal Indian hot, dry season. Some rain occurs from March onward, but the real force of the monsoon is felt between June and September, when widespread and destructive flooding often occurs. Rainfall in Assam is not only the highest in the country but also ranks among the highest in the world; its annual average varies from 70 inches in the west to more than 120 inches in the east. Air : The nearest airport is Lilabari (North Lakhimpur) in Assam, 57 kms from Naharlagun and 67 kms from Itanagar, served by Vayudoot. Indian Airlines operates direct flight from Calcutta to Tezpur ( 216 kms from Itanagar ) on Wednesday, Friday and Sunday. Rail : The nearest railway station is Harmuty (near Banderdewa check gate) only 23 km from Naharlagun & 33 km from Itanagar. However nearest convenient railhead is North Lakhimpur in Assam, 50 km from Naharlagun & 60 km from Itanagar. Stations are served by No.9 and No.10 Arunachal Fast Passenger Trains and other local services. Itanagar is connected by road to : Guwahati - 381 km (Gohpur 79 -Ballipara 110 -Mission Charali 17 -Orang 53 -Baihata Charali 90 -Guwahati 32), Shillong - 481 km ( Guwahati 381 -Shillong 100 ), Agartala - 980 km (Shillong 481 -Badarpur 211 -Agartala 288), Aizawal - 901 km (Badarpur 692 - Silchar 29 - Aizawl 180), Kohima - 350 km (North Lakhimpur 73 - Jorhat 69 - Dimapur 134 -Kohima 74) , Imphal - 495 km (Kohima 350 - Imphal 145).